We can make bootable USB drive for openSUSE in several ways. In openSUSE itself, there is a graphical program named SUSE Image Writer available for this case. In Ubuntu, there is no SUSE Image Writer available. But we can use available GNU dd command to do the same job. To locate exactly the USB device we can use lsblk and blkid tools. To show dd output in a (almost) real time way we can use pkill tool. Note: using dd will erase all the data inside the USB drive, so please make backup first. Here the procedures provided step by step. Warning: you must locate the device location correctly and you can not select incorrect device here, otherwise dd will destroy completely all of your data. Please don't perform any of this while you are in sleepy condition. To locate the correct usb device, perform lsblk command and you will see similar output like a picture below. 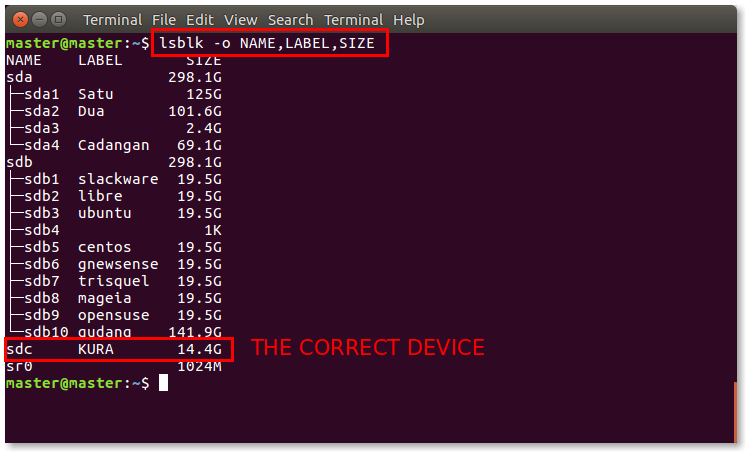 In this example, our USB drive is /dev/sdc with the label name KURA and size 16 GB. The /dev/sda and /deb/sdb are our hard disk drive, not the correct USB drive, so we don't touch them. Again, read carefully and choose correctly here. To make it sure, perform sudo blkid command and see where is your USB drive. 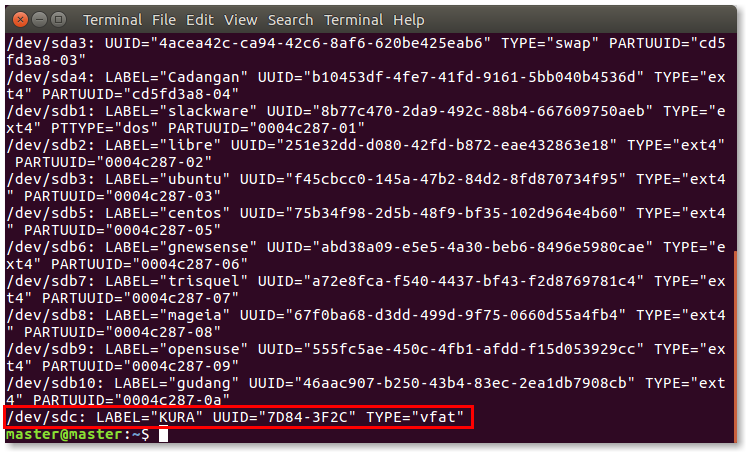 This picture showing that our device is correctly located at /dev/sdc with the label name KURA and using filesystem vfat (FAT). While another devices listed are not USB drive, they are hard disk drives, don't touch them. To locate the image file, simply use pwd command to show current directory of your bash prompt. See The Steps in One Picture above at the first command. The result is currently our bash prompt is located at /media/master/gudang/openSUSE-folder/ directory. The ISO is located inside the openSUSE-folder directory. This is shown by ls command, the second command in the picture. Before doing writing, make sure the USB drive is not mounted. The simplest way to do it is by clicking Unmount button (reversed black triangle icon) in Nautilus. It means dd will use block size 4 MB to write the openSUSE image into /dev/sdc device. Again, still in the same picture, you see a red arrow from lsblk into dd, indicating you must see the correct device first to type the command argument of=/dev/sdc. Note: GNU dd has no real time output. While writing, dd shows only a blinking cursor. You have no idea about its writing progress details. Follow the next instruction. See The Steps in One Picture above at the number 3. See the red arrow from right Terminal pointing into left Terminal. 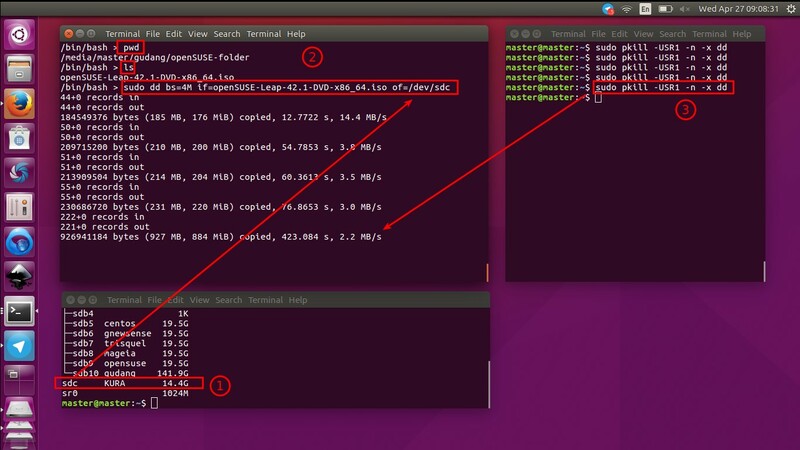 You perform pkill from another Terminal, then the current Terminal (performing dd) shows the progress of dd. It is a summary of the whole writing progress. Total size of openSUSE image written is 4.6 GB with the writing speed around 2 MB/s. Reboot into your USB drive and meet the openSUSE installer.